Here are some excellent healthy recipes created or modified by Paulina Bystritsky and her mother-in-law, Ellen Sheridan. Click here for Paulina’s tips on preparing healthy food. The recipe for this soup was passed on from the chef at the Petersham Hotel. A weekday lunch, sitting at a table with a view over the Thames – highly recommended! 4 small to medium parsnips, 1 green apple, 1 carrot (peeled and roughly chopped), 1 onion or leek chopped, 1 crushed garlic clove, chilli sprinkles (optional), 1 organic vegetable stock cube, kemp and salt to taste, 2 tablespoons of sunflower oil, 1 litre of water. Chose a pan with a lid that can hold all the ingredients with ease. Coat the bottom with oil and warm it up. Sauté the leeks and garlic until soft with the chilli, add the apples, carrots and parsnips and continue sautéing for a few minutes. Pour in the water and stock, and allow to simmer over a low heat for 30-40 minutes or until the vegetables are soft. Use a hand held blender to puree … a lovely warm treat for when the weather gets colder and the days somewhat greyer. 2 large sweet potatoes and 1 carrot ( peeled and roughly chopped), 1 leek, 1/3 cup of yellow split peas (rinsed, there is no need to soak), ½ cup of red lentils (rinsed , there is no need to soak), 1 litre of cold water, 250 grams of watercress (rinsed) and 1-2 tablespoons of sunflower oil. Celery is optional. Salt and pepper, freshly ground chilli or chilli sprinkles, garlic, thyme etc to taste depending on your preferences. Choose a pan with a lid that can hold all the ingredients with ease. Coat the bottom with oil and warm it up. Sauté the leeks until soft. Add the sweet potatoes and carrots and sauté for a few more minutes. Pour in the water, the yellow split peas and red lentils and allow to simmer for 30 minutes covered with the lid. Just have it bubbling, not foaming, using a low to middle flame (setting 4-6 depending on your hob). Add the cress and allow to simmer for a further 15 minutes, the watercress should be soft and fall apart easily. Use a hand held blender to puree it. Nice and very comforting for the winter ahead! Preheat the oven to 180 degrees c (with fan) or 200 c without fan. Close the foil by joining the sides on the top and forming a tent like shape (this will allow the steam to flow evenly around the salmon fillet) or use a separate piece of foil to make a lid of foil above the salmon. Sit on a baking tray and cook for 20 min. Open the foil and allow it to get lightly golden by leaving it five more minutes in the oven. Preheat the oven to 180 degrees c (with fan). Mix finely chopped leek and finely chopped peppers (any colours) in a pan and sauté lightly for a few minutes with a small amount of (olive) oil. Add about half a litre of water with 150 grams of double concentrated tomato puree (about half a tube). Add one teaspoon of brown sugar, 1-3 teaspoon of Worcester sauce (makes it spicy, to taste), one tablespoon of lemon juice and half a teaspoon of English mustard (optional). Add optional spices, like chilli and garlic, thyme, sage etc. Simmer for 5-10 minutes (avoid heavy boiling, the longer it simmers the nicer). Place skinned chicken thighs and breasts on tin foil in a baking dish. Spoon over the vegetable mix. Cover the dish in foil and cook for an hour to an hour and a half. 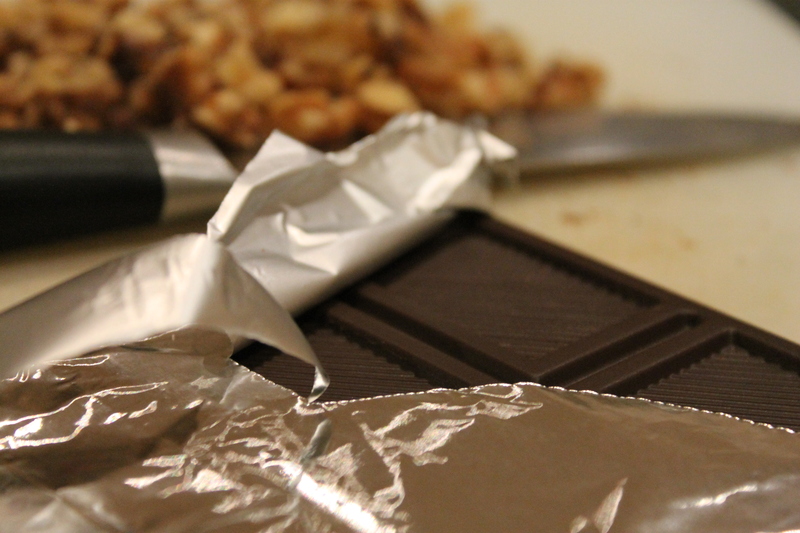 Take off the covering foil towards the end (last 15 minutes). Chop the apples. Beat the eggs with the sugar. Add the oil and vanilla. Mix baking soda, cinnamon and flour separately then add to the egg mix. Add the cake mix to the apples and add the chocolate pieces. Stir. Add the nuts. 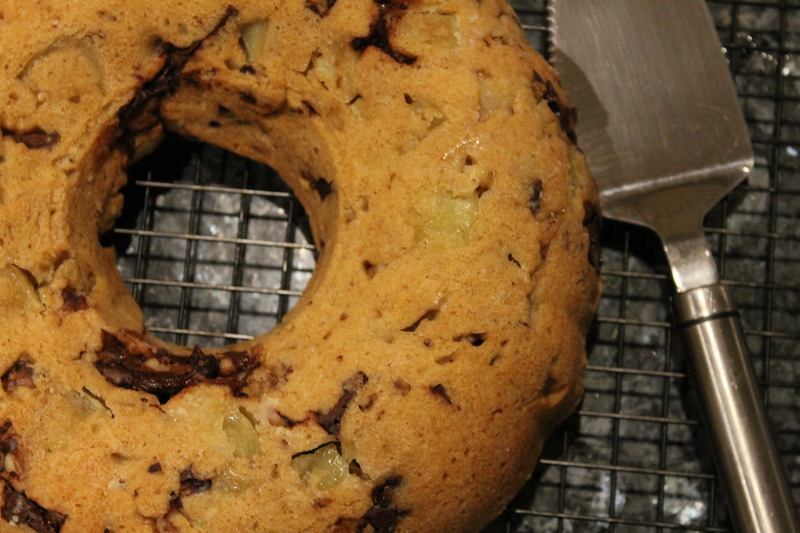 Pour into a greased (with sunflower oil or butter) 10 inch tube pan or round cake pan with central hole. Bake at 180 degrees without fan for up to 40 minutes, then start checking with a toothpick and bake for up to a total of 55-60 minutes depending on your oven. I vary this cake a lot and it always comes out a bit different. So I will give rough quantities and you can play around with the recipe as well! It usually takes less than 10 minutes to get the preparation done and about 40 minutes in the oven. 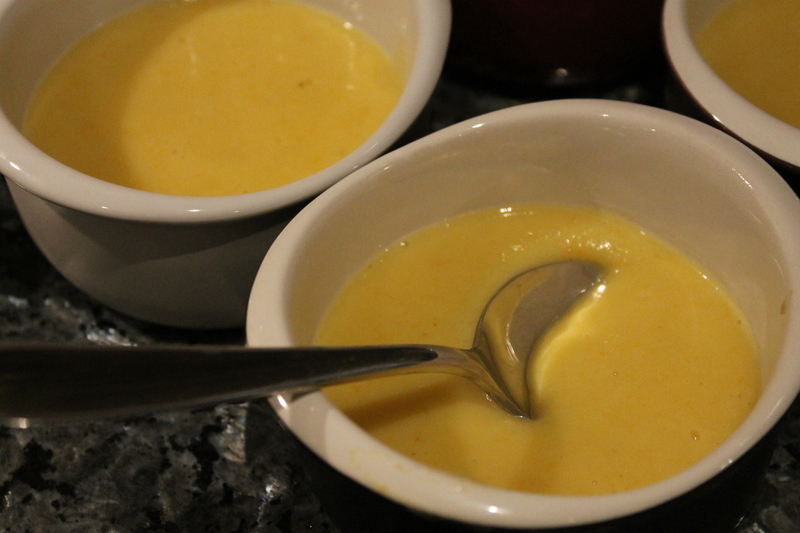 If you feel up to it, beat the egg whites separately with the sugar, until not runny, then add pre-whisked yellows. If feeling a bit lazy, just mix all the eggs with the sugar with a whisk for a short time. I have sometimes removed banana and ground almonds from the recipe and it has been very nice as well, up to you! Now add the lemon juice, vanilla, cinnamon and a drizzle of honey. 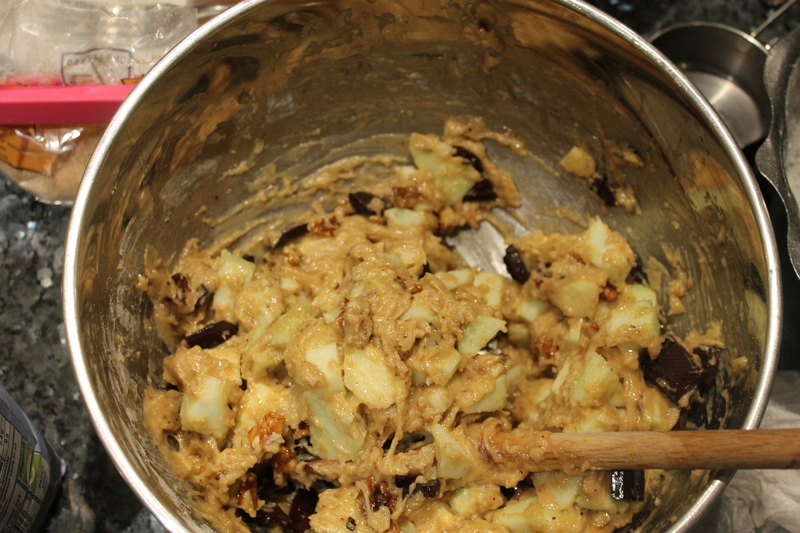 Once you feel the mix is right in consistency, runny enough but not too runny, you can finally add the chopped dry fruit, and the walnut pieces. You should still be able to stir the mix, make sure it is not overpowered by the dry fruit and walnuts, but that there are fruit and nuts throughout. Butter – or oil with sunflower oil – a 30 cm cake tin and preheat the oven. Pour in the mix, which probably comes up half way to the top of the tin – don’t worry, it will rise. Bake in the middle to lower part of the oven for at least 30 minutes at 160 degrees with fan and 180 degrees without fan. Check with a toothpick for readiness, when the toothpick comes out moist but not covered with cake mix it is done. If kept longer it might get dry. Take out the cake. You can ‘glaze’ it with a variety of things like vanilla extract (sweeter option), lemon juice, cranberry juice concentrate etc. Cover with tin foil to cool slowly.